This room is a huge design challenge. It’s really long, with low ceilings, a dark brick fireplace, and the only natural light comes from the sliding door … which faces north … towards trees. So it’s dark and long and just generally a super awkward space. 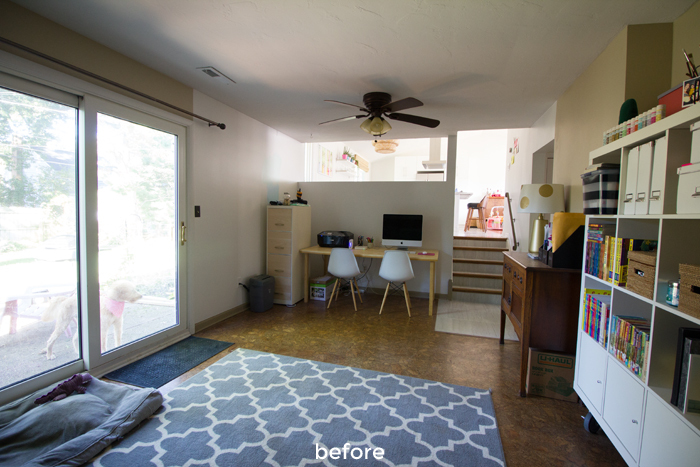 Also, since the sliding door is smack in the middle of the room, it essentially divides the room in half, making two small areas on either side that are only kinda sorta useable, and then a big space in the middle that you can’t really do much with or risk blocking the door. Ugh. Another issue with this room is that since it’s the door to the backyard, there is absolutely no way to avoid dirty paw prints. So a nice rug is out of the question. 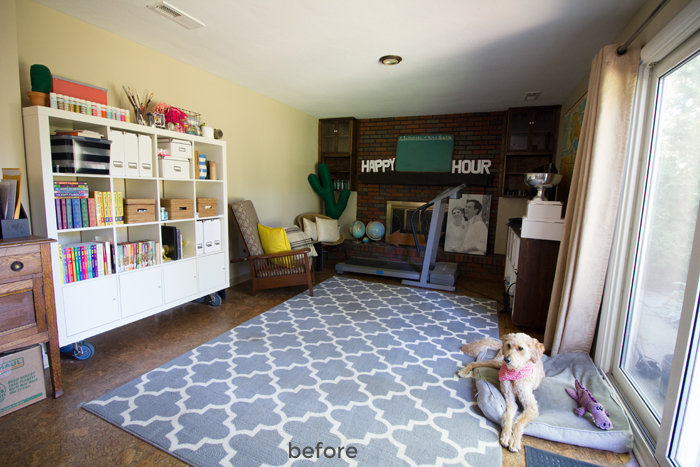 These photos are actually making this rug look WAY cleaner than it is in real life. Literally the things that are sitting on and around the fireplace we put there the day we moved in and just haven’t bothered to move. 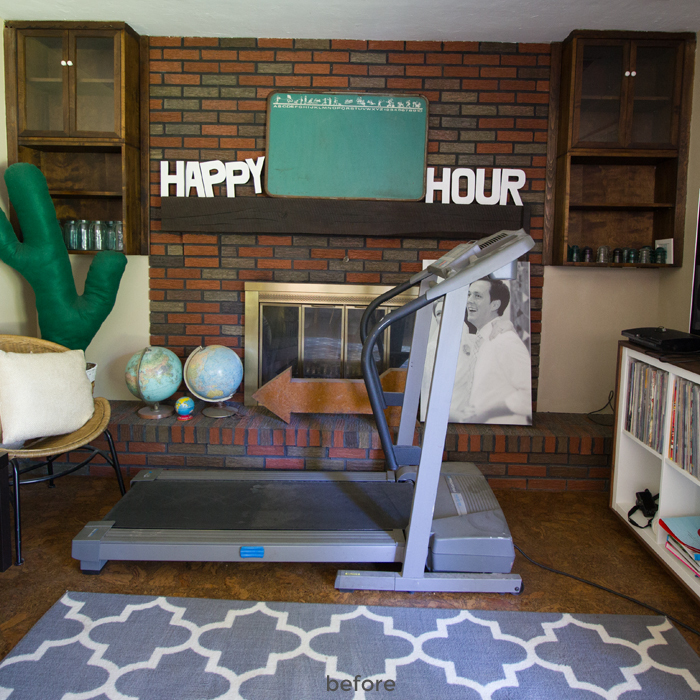 A few weeks ago we tried to create a little TV-watching zone by the fireplace, but we’ve never used it because, well, for one, there’s a treadmill in the way. I’m also really, really not a fan of the fireplace’s color, so a paint job will definitely be happening! On the opposite side of the room is our little office space. We’re thinking about moving the office upstairs to the third bedroom eventually, though I do enjoy having the computer out in the open, especially once Joey is crawling and we’ll spend more time in here. In the middle of the room our Expedit bookcase holds all my craft supplies. You may notice that the wall on the left is painted white part of the way. 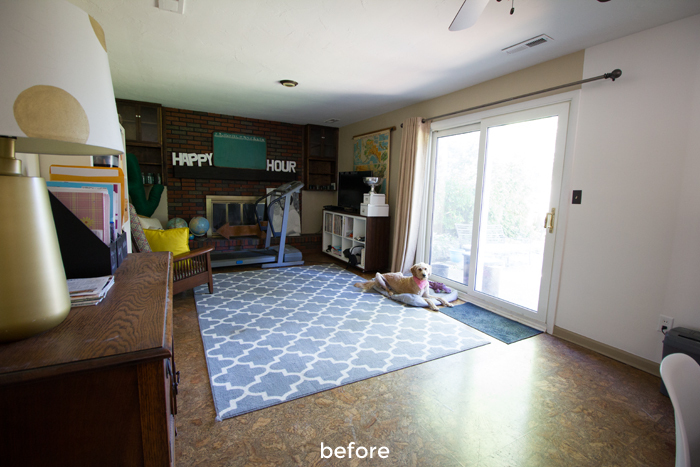 When our kitchen was renovated, we had a half wall built where there used to be a metal gate (in front of the desk), in that open space between the kitchen and family room. When they painted the new half wall, they needed to paint the other wall, too, to blend in all the new drywall. 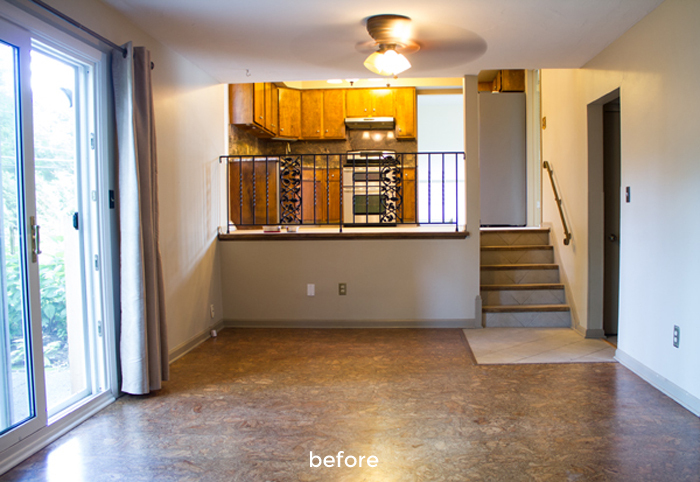 Here’s a picture of what it looked like from this angle when we moved in, with the old gate and old kitchen! The floors, if you’re wondering, are cork. We’ve looked into replacing them, but they’ve actually grown on us. So that’s the family room. I think this room has a ton of potential, but we just have to figure it all out. We have lots of ideas that I’m excited about!